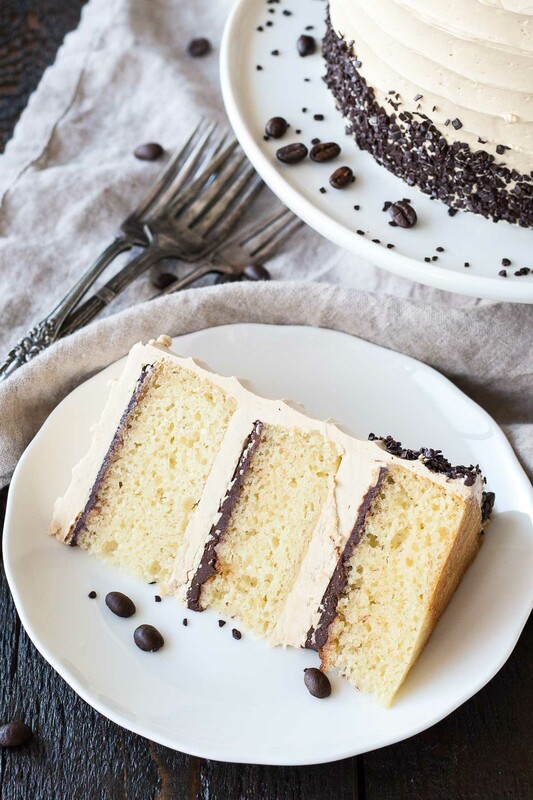 The perfect pairing of coffee & Baileys in this delicious layer cake. 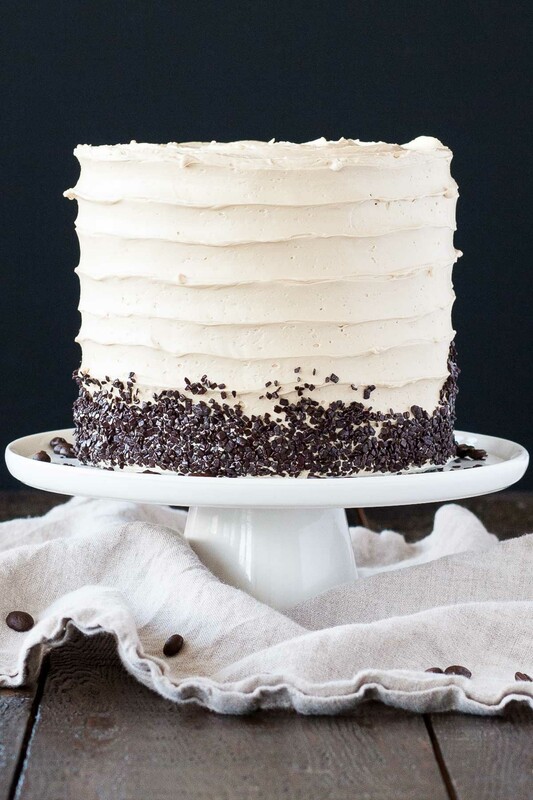 A vanilla buttermilk cake layered with dark chocolate ganache and a coffee Baileys swiss meringue buttercream. Coffee & Baileys is one of my favourite flavour combinations. While we’re not big drinkers around here, you can bet we always have a bottle of Baileys in the fridge. We don’t drink it on it’s own, but it often gets added to hot chocolate, or coffee, or a variety of baked goods. It’s been a while since my last Baileys recipe, and I’ve been meaning to do a Coffee & Baileys buttercream for a while. I opted to go with a Swiss meringue buttercream this time, as opposed to a standard American buttercream. The American is easier to make, but I prefer the taste and texture of meringue buttercreams overall. They are much smoother, and not quite as sweet. 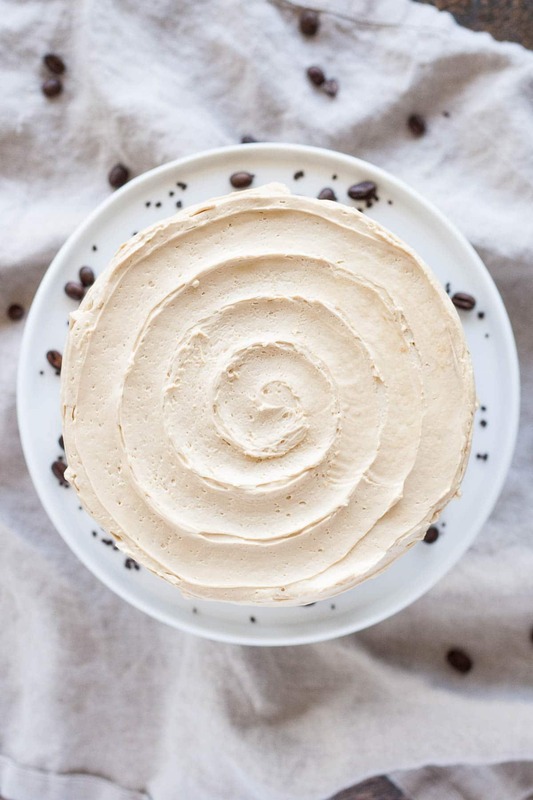 I added both espresso powder and Baileys to the buttercream, but you could leave either out if you prefer — you’d be missing out on a pretty delicious combo though! I wanted to keep the decoration on this Coffee & Baileys Cake clean and simple, so I opted to go with a pretty swirl pattern like I had done before on my Nutella Hazelnut Cake. It’s a really simple way to give a cake a fancy looking finish. The swirls are far from perfect (especially on the top), but I didn’t let that bother me, which is HUGE for me. The old Olivia would have smoothed the whole thing down and started over. The new Olivia clearly has better %^&* to do. It’s supposed to be rustic anyhow! I pressed in some chocolate flakes along the bottom for some contrast using the same technique I used for my Funfetti Cake. Another simple way to fancy it up a bit. I also wanted a bit of contrast between the vanilla cake layers and pale coffee Baileys buttercream, so I spread a thin layer of dark chocolate ganache on each layer. I think it adds a nice pop of color, and pairs well with the chocolate flakes on the bottom. This is one delicious cake! 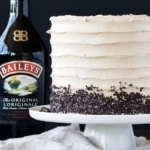 If you’re a coffee and baileys fan, you’ll be eating that frosting by the spoonful. The vanilla cake lets the buttercream flavour stand out, but the buttercream would pair just as well with a chocolate cake if you prefer! 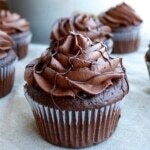 Be sure to use espresso powder, not espresso granules in the buttercream. The granules will not dissolve. This is the kind that I use and it works perfectly. If you can’t find espresso powder, then you can use espresso granules, but be sure to dissolve them in 1 Tbsp hot water first. Cool completely before using in frosting. I get my chocolate flakes at The Gourmet Warehouse here in Vancouver, but these ones seem comparable (though it’s hard to see in the pic). If you like this cake, be sure to check out these Baileys Cheesecake Cookie Cups, Baileys Hot Chocolate Bundt Cake, and these Coffee & Baileys macarons! 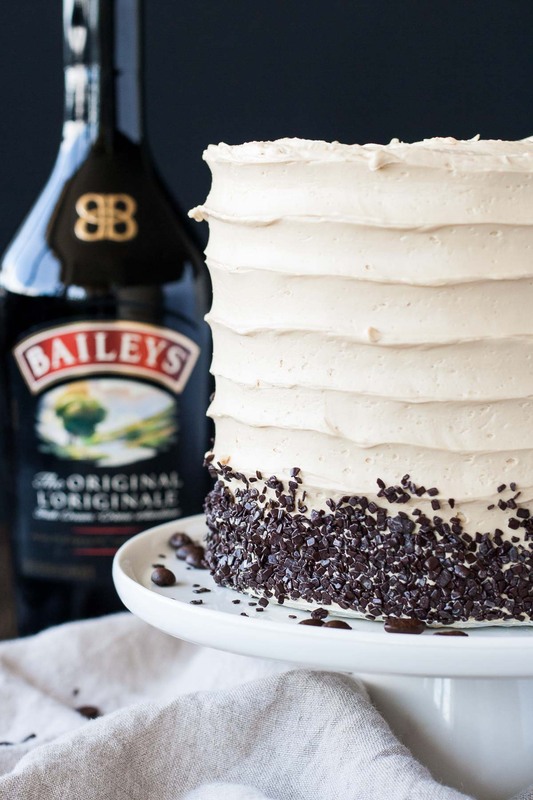 The perfect pairing of coffee and Baileys in this delicious layer cake. 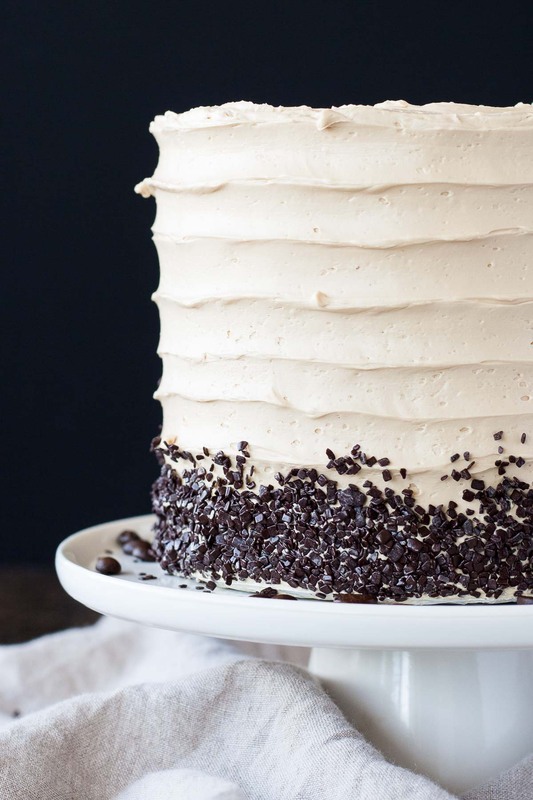 A vanilla buttermilk cake layered with chocolate ganache and a coffee Baileys swiss meringue buttercream. In a medium bowl, whisk flour, baking powder, and salt and set aside. 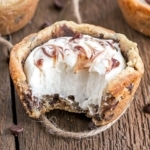 Place chopped chocolate and cream into a microwave safe bowl, stir. Microwave on high for 30 seconds, stir. Again, microwave on high for 30 seconds, stir until smooth. Cool completely until thickened, ideally overnight. Place one layer of cake on a cake stand or serving plate. Spread a layer of ganache and then top with buttercream. Repeat with remaining layers and crumb coat the cake. Chill for 20mins. Frost the cake and do a decorative swirl with an offset spatula if desired. Add chocolate flakes to the bottom if desired. I loved this recipe! The cake was moist and soft, I added a bit of Bailey’s for flavor instead of vanilla, it was fantastic! Do you have any tips on the buttercream? Mine was very very curdled, and I kept whipping it but it got progressively worse 🙁 I’m about to try again with stiffer egg whites, is there anything else I should watch for? Hi I’m currently making this when you say cool the ganache ideally over night, are you putting it in the fridge? Hi Taylor! No, I leave it on the counter and then microwave for about 5 secs before using. Hi Olivia I would love to make this cake in the 10″ and 8″ cake pans. Should I double or triple the recipe? Hi Mariah! Did you use 6″ cake pans? If so, be sure to not overmix the batter as that can cause smaller, denser cakes. Love the sound of this cake! But I don’t have a paddle attachment for my mixer. What’s the best way to do it without the attachment? I tried doing it with the standard mixer but I think it may have split the ingredients (if that’s even possible haha). Also, having the mixture split is possible no matter what you use. Be sure all of your ingredients are at room temperature and that you alternate the flour/liquids. Usually though, a split cake batter bakes up just fine. It’s an electric mixer just a very cheap one so it only has one attachment type (whisk). The cake batter was great (thanks to your recipe), it was the butter cream that I had the issue making. Ah yes. It would not be the best for the frosting 🙁 BUT Swiss meringue is notorious for splitting or looking curdled at some point. It will come back together, you just need to keep whipping it! This cake looks so delicious that I wanted to make it for a birthday. However, I loved the design and pink look to the pink champagne cake. I was wondering if I could use this recipe to get the flavour, but make it pink and design is like the other one? Hi Alexandra! That should work but the frosting will be tinted brown if you use the coffee & baileys. Can you please tell me if you use power egg whites or fresh? If you use fresh, how many eggs does it take for 1/2 cup? I plan to make this cake for St. Patrick’s Day! I immediately falling in love with the cake. however, i cant seem to find buttermilk. Can i replace it with sour cream? always curious, can you use liquid egg whites for baking opposed to whites separated from eggs? 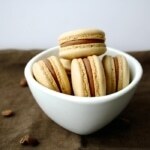 I particular to this recipe and your coffee baileys macaron recipe? Hi Ann Marie! I tried liquid egg whites once for macarons and it was a huge fail. The meringue totally didn’t whip up! Perhaps this was a one off or an issue with that particular brand, but I haven’t tried them since 🙁 In a cake though, liquid would be fine, but I wouldn’t use them for any kind of meringue. When you say line with parchment, do you mean just the bottom or the sides as well? I made the cake and flavours were excellent, but the actual cake turned out quite dense and very uneven. I had a question about the hot water bath. When you say to put it over the stove, should the stove be on? If so, what setting should the stove be at? Thanks! Hi Hope! Yes, the stove should be on. What I do is I pour a bit of water into a pot (not a lot, a couple inches), bring it to a boil, then reduce the heat to low so that the water continues to simmer while I have the bowl of egg whites over top of it. I hope that helps! I made this cake for a family dinner tonight and the frosting and ganache combo was amazing!! I was a little disappointed that the cake turned out crumbly and slightly dry. Several other comments said it was moist so, maybe I did something wrong? Hi Courtney! Sorry to hear that it was dry :\ Is it possible that it got overbaked? Or perhaps something was off in the measurements since it was crumbly too. Did you use 6×2 or 6×3″ pans? Hi Donna! I use 6×2. Let’s see how I pull together. I was just curious if there was a reason why you only used baking powder in the recipe, instead of both baking powder and baking soda. Most buttermilk recipes use both, so that there isn’t to much of an alkaline or acidic taste. So, I suppose what I’m asking is: is there a particular reason for this and do you think it would come out fluffier/more balanced (flavor-wise) if I were to use both? Thanks so much and I can’t wait to see how it all turns out! I want to be precise while making this cake and since I’m used to “grams”, could you tell me how many grams of butter do I need in this buttercream? Some pages tell me that it 1 1/2 cups is the same as 342 grams – is that right? Hi Naz! I always bake my layers in advance since I like to spread the cake-making out. Make sure the layers are completely cool before frosting. I’ve updated the recipe with assembly instructions. I hope that helps! I made this cake for St. Patrick’s Day. It was outstanding! The cake itself is moist with a lovely texture — probably one of the best I’ve ever had. The buttercream is light and creamy (I guess a cup and a half of butter will do that for you). I was a bit concerned that the espresso powder would make the buttercream a bit bitter but the flavours blended beautifully. This one is a definite keeper! Thanks, Olivia, for a great recipe. Hi Ana! Hmm, the espresso powder I use is very fine (the consistency of powdered sugar, not granules) so it blends in easily. Next time you can try dissolving it in a Tbsp of hot water first before adding it to the frosting (make sure it cools completely though). I hope that helps! Looks amazing! I wanted to make this cake for my boyfriend’s birthday. All of his favs in one beautiful package. I was wondering, if I wanted to make the cakes ahead of time, would I be able to freeze the cake portions and frost it when I am ready? And if I could, how long would I be able to keep it in the freezer before it would change the texture of the cake? Thanks in advance. Hi Helen! I often freeze my cake layers after baking, just be sure to wrap them well in plastic wrap and/or put them in a freezer bag. I’ve kept them in the freezer for up to a month with no issues as long as they are well wrapped! Hello! Does this recipe work if I use cake flour? Hi Emily! Sorry for the delayed reply. I hope it worked out ok! I would recommend adding espresso powder to the cake for a coffee flavour. You could try to use 1/4 cup coffee and 1/2 cup buttermilk, but I have never tried it. Let me know how it turned out! Is 11/2 cup butter 360 grams? Hi Dean! Was the meringue very stiff before you added the butter? I’m thinking perhaps it didn’t whip up properly. How soft does the buttercream get out of the fridge? It’s supposed to be quite soft and silky at room temperature, but should still hold its shape. Hi Olivia. This recipe is so delicious. Instead of Baileys, can I use Coffee liquer? Thank you so much. Always love your recipes. Hi Vidollia! You can totally use coffee liqueur instead :). Let me know how it turns out! Can you please tell me what technique you used to get the swirls? Hi Kelly! I used a small offset spatula and pressed it into the side of the cake as I turned it on a turntable. I hope that helps! Amazing cake. Can’t wait to try it. I was wondering, can I use two 9″ Pam’s instead of the three 6″ as mentioned? And would I have to add a lil more to the ingredients? Thanks. Hi Val! You could use two 9″ pans, though your layers would be a bit thinner than mine are. Teg caje looks amazing. Id love to try it out but how is the cake assembled? Hi Sukriti! 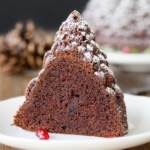 To assemble, place one layer of cake on a cake stand or serving dish. 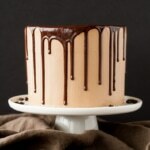 Spread a thin layer of ganache over top (note: the ganache should not be runny and should be a spreadable consistency). Then top that layer with about 2/3 cup buttercream. Repeat with remaining layers and frost the outside. Hello! Can I use an espresso shot instead of powder? How many servings? Am I overlooking that? Wanting to makes this as a grooms cake. Thanks! Hi Melissa! It depends on how generous the pieces are 😊. I’d say about 10 servings or so. Thank you! I cut the recipe in half and did a trial run. It is yummy! May end up doubling it…too good to be too stingy on serving size. Wish I had a kitchen aid mixer for the frosting. Lol Thanks again! Good call on the doubling! 😉 And yeah… a KitchenAid mixer is a lifesaver! Melissa, I am 60 yrs old n just got a Kitchen Aide mixer ( 230.00 @ Walmart) n I soooooooooo wish I had invested in one years ago- as I have made so many cakes since age 13 I can’t even begin to count. I am so happy with it n glad I invested in one- well worth the money!!!!! Hi Gigi! 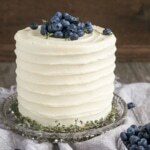 The amount of buttercream in the recipe is enough to frost and fill this cake. Hi, as a UK reader could you please tell me (if possible )what the metric measurements would be? My mother-in-laws birthday coming up soon and she is a huge Baileys lover. Hi Kristy! I I don’t have the measurements in metric, but you can find some conversion websites online. I’ve used this one before and find it works well but make sure to convert each specific ingredient individually (you can select them on the right side). I’ve always used icing sugar instead of granulated. I don’t get the grainy texture this way. Could I then omit the water bath? Hi Candy! The water bath is to also cook the egg whites so they’re food safe. I’ve never made a Swiss meringue buttercream with icing sugar so I’m not sure that it would work! Hello. Quick question. 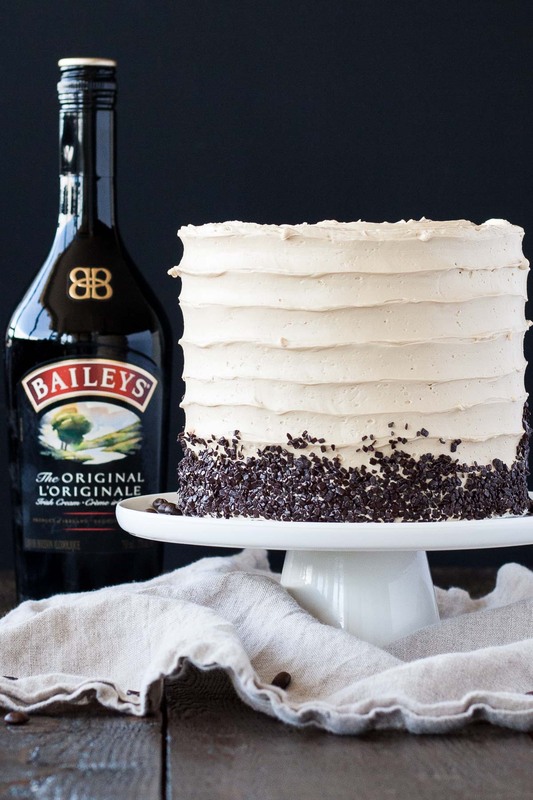 Can I use Baileys instead of buttermilk in the cake? Thanks! Hi Matt! No, the buttermilk needs to be there. If you’d like more of a Baileys flavour, then I would recommend swapping the vanilla for Baileys and increasing it to as much as 1 Tbsp. Let me know how you like it! Thank you for your replay!! I can’t wait to try the cake. It’s for my birthday LOL. Yum! Did you really mean 6in cake pans? Hi Sandra! Yes, but you could use two 8″ rounds instead of three 6″ if you prefer. I’m looking forward to preparing this amazing cake! I was wondering, can I use 2 eight inch instead of 3 six inch pans? I was going to slit the 8 inch layers. Hi Ines! Yes, two 8″ pans will work perfectly :). Let me know how you like it! Beautiful! Where do you buy the chocolate flakes? I had some a long time ago and loved them but can’t seem to find them any more. Thanks! Hi Debbie! I bought them at a local store here in Vancouver called The Gourmet Warehouse. Haha no worries! Happens to me ALL the time ;). And thank you!! This cake is absolutely gorgeous Olivia! 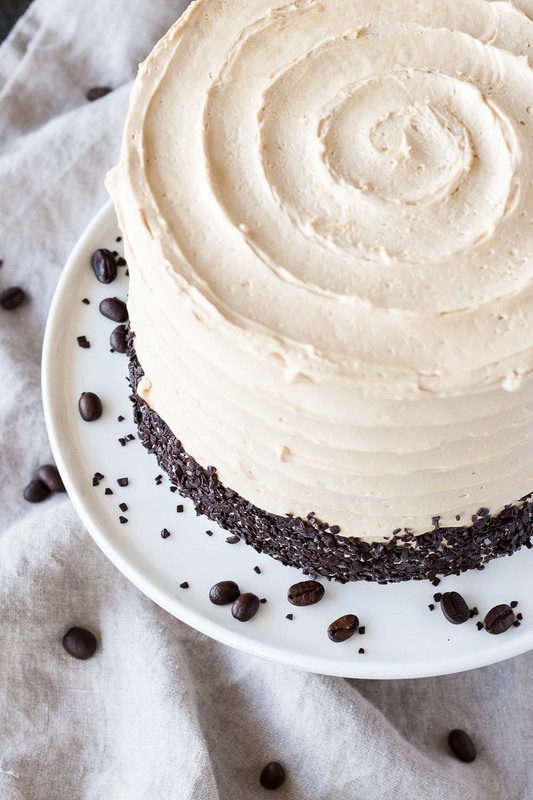 And that Coffee Bailey’s Buttercream sounds unbelievable! I think I would have to double that buttercream recipe because I would be eating too much from the bowl before it got to the cake!! Thanks so much Mary Ann! Much of the buttercream was consumed with a spoon before making it to the cake for sure, haha. Bailey’s buttercream is da bomb! Love the swirls and chocolate flakes and everything about this cake!! Looks wonderful and sounds delicious. 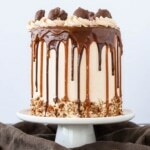 How do you get your cake layers and filling layers so even? The inside is just as pretty as the outside. Thanks for the recipe. Hi Brandi! Thank you! For the cake layers, I use a scale to weigh the batter (I know) so that they are as even as possible. The filling is harder to gauge! I usually test to see how thick it is my sticking my offset spatula down into the frosting — if that makes sense. Then I try to make sure the rest of the layers have about the same amount. I hope that was helpful and not completely confusing :). GMTA! I just make a Baileys cake for my friend’s birthday. I sure wish I’d seen your post beforehand, because I love the way you decorated yours. I think your swirl patterns are beutiful! Personally, I don’t think that one should srive for perfection in a homemade cake. It should look like it was made with love, and yours definitely does! I love the swirls! They add texture and character to the cake. It looks amazing and I can’t think of a more perfect pairing. Gotta love Baileys. My parents arrive next saturday from Canada for a visit, i think i Will have to make this for their Arrival. A special,cake for two special people, love Your site. Yay! Let me know how you like it 🙂 And thanks!! Thank you so much Kristin!! This cake sounds absolutely PERFECT! Love the chocolate ganache in there too. Totally swooning right now.